But anyway , over this past week i borrowed a book from the library . I was actually looking for fish keeping book , especially Cichlid book . Then i ran into cookbook shelves , right by the animals . I landed on Nigella Lawson’s cook book . I used to watch her show , back when my son was little baby . And i love cook books , i collect cook books , but i don’t have any of her book . So i checked it out , and last night during my relaxing time , i went through it . Wasn’t a good idea , because it was late , around 10 pm , and i was getting hungry looking all those pages full of food pictures ! My choice for today’s dessert landed on something easy and quick , yet looks delicious . It was Chocolate Orange Loaf . 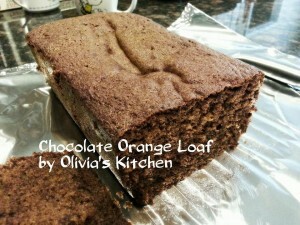 It turns out really good , make sure you use a good quality unsweetened cocoa powder . And the rest , is really not complicated recipe at all .Have fun and enjoy ! 1. In a mixing bowl , beat the butter until creamy , add the corn syrup , mix well . 2. Add in the brown sugar , and beat until light in color for few minutes . 3. In a mixing bowl , mix the dry ingredients , flour , baking soda and cocoa powder . Add 1 tbsp. into the butter mixture , then add 1 egg , then add 2 or more tbsp. of dry ingredients into the butter mixture , and add in the 2nd egg . Adding the rest of flour mixture into the butter egg mixture , keep beating . 4. Add in the zest and the juice until mix well . 5. Grease 5×8 loaf pan , line with parchment paper , pour the batter in and bake at 325 F for 45-50 minutes .